Central Piedmont Community College (CPCC) has added a new Cosmetology program that will begin in the fall 2013. “August 15 is the official beginning,” said Catherine Cunningham, program coordinator, Cosmetology. Unlike other Cosmetology schools, CPCC will offer an accredited two-year AAS degree in Cosmetology and classes may be transferred to other four-year educational institutions. The Cosmetology program will be taught from the international cosmetology curriculum, Pivot Point. According to Pivot-Point.com, Pivot Point has provided the best hair and beauty education in the United States. Cunningham shared that Pivot Point curriculum is and has been well respected in the cosmetology community for more than 50 years. According to the Cosmetology program’s online frequently asked questions and answers, the estimated cost of the five semester program is $7,300. These costs include tuition, fees, uniforms, textbooks and the student cosmetology kit. The program does accept financial aid. 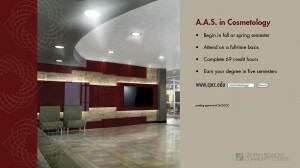 Eligible students must have a 2.0 GPA or higher to enter the program. CPCC’s Cosmetology program will have 40 seats every fall and spring semester for full-time students. “We still have seats available for the fall,” said Cunningham. Classes are filling fast and will be held at the completely renovated City View Center, located at 1609 Alleghany Street, Charlotte, NC 28208. Classes will be held Tuesday through Friday from 8 a.m. to 3 p.m. “Completion of the new renovations will be on July 19,” said Cunningham. Students will also provide the public with hair, skin and nail services at discounted rates after they have completed 300 practice classroom hours at the City View Center under the supervision of licensed instructors. “City View Center will be a 50-salon chair clinic,” said Cunningham. Services will include cutting, coloring, perming and styling hair. “Students will learn to work with all nationalities of hair,” said Cunningham. Students will also provide facial services of deep cleaning, makeup application, eye brow waxing, as well as nail care services with real or acrylic nails and nail art. Cunningham said CPCC will work with the job placement office after students have received their Cosmetology degrees. “I’m sure salons looking for successful graduates with exceptional guest relation skills will be attracted to CPCC’s Cosmetology graduates,” said Cunningham. Cunningham said this program is for students who like to be around people and make people feel good about themselves. “At some point this industry touches everyone in some way,” said Cunningham. This entry was posted in Campus, Learning and tagged AAS, AAS degree, City View Center, classes, cosmetology by Adam Brooks. Bookmark the permalink.